Zoom car had been reluctant to add Maruti cars to their self drive fleet. Ertiga, Swift and Swift Dzire were very popular cars and extremely driver friendly and fun to drive. But for some reason they stayed clear of Maruti. Very recently they added Maruti Ciaz to their fleet- that too an automatic one. Maruti’s strength has been in small cars and they didn’t really have much success in premium segment. Ciaz competes with well-established Honda city, Hyndai Verna and the likes for market space. Out of curiosity to check out this car, I booked it for 4 hours- minimum requirement under Zoom’s rental policy. That cost me Rs 600, with 40 km fuel included. On a Sunday afternoon, roads were not that full, so I could drive around Rajajinagar comfortably. The 40km limit was not adequate to go out of town and hit the highway. 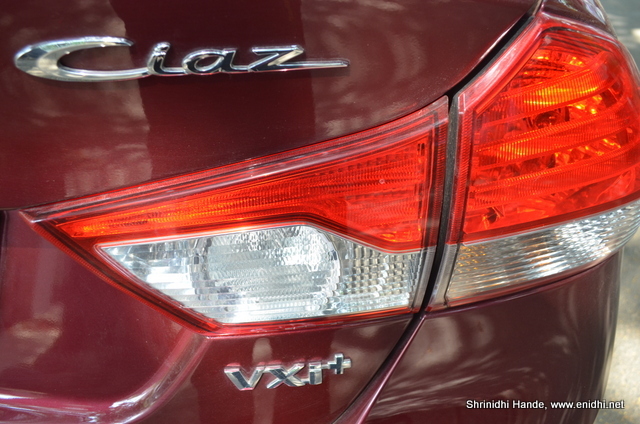 From what I could experience in 4 hours/ 40kms, below is a brief review of the Maruti Ciaz VXi+ automatic. Car had lots of dents and scratches already all over it, all within its 6000+kms on the odo. Zoom car staff were present at the venue and I could also unlock the car using app. 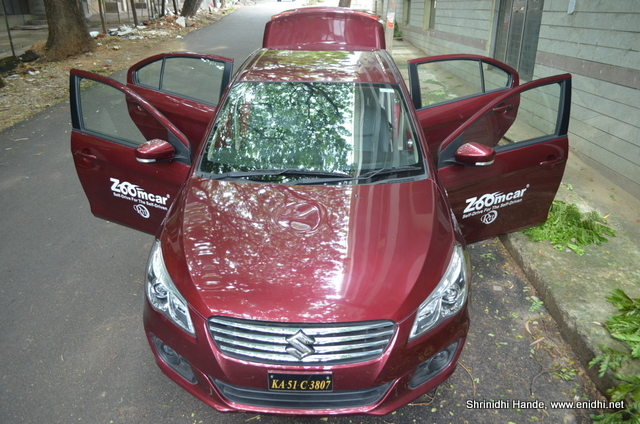 Ciaz’s automatic unit is much more mature and sophisticated than cheap AMT unit found in Celerio. This fully functional automatic unit gets a '2' and 'L' mode, for extra torque during uphill drive. 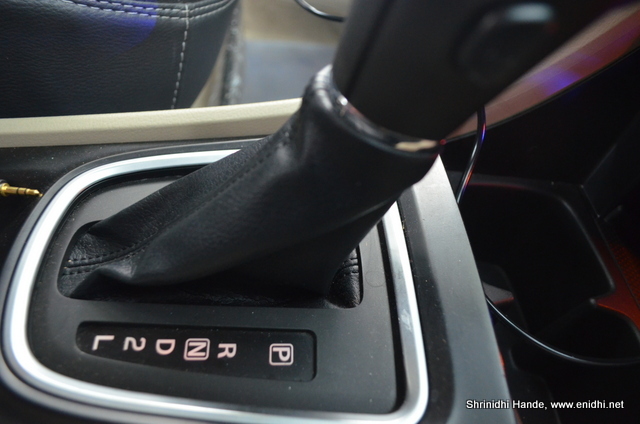 Ciaz gets a 4 speed transmission- it is possible to turn off the 4th gear (overdrive) and confine the car to first 3 gears, using a small button on the lever. There is no sports mode or manual mode. On an open road, if you floor the gas pedal, Ciaz’s engine and transmission makes desperate attempt to change gears and gain speed. In the process it makes grueling sound like that of the sports car- might be music to few and irritant to others. I made a video of this sound, but quality of audio is not good for readers to feel, hence deleted it. So it is not good for drag race. But give the car its time and it will pull along gently and steadily, without any noise or struggle. Thanks to Zoomcar’s rules I couldn’t push it beyond 125kmph, so unable to comment on its high speed performance. Creep function also works smoothly, only on level areas. 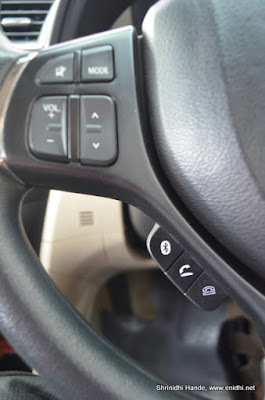 In uphill/downhill situation lifting your leg off the brake doesn’t move the car forward- you need to press accelerator. 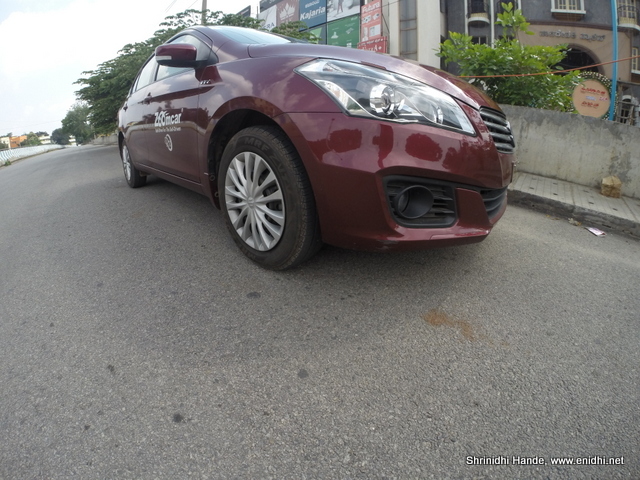 Ciaz improvises on the thick obstructive A pillar that SX4 was famous for. Driving was overall fine. No reason for complaints. Interior feels nice. The curves on the dashboard gel gently with the centre console and culminate with rear AC vents. 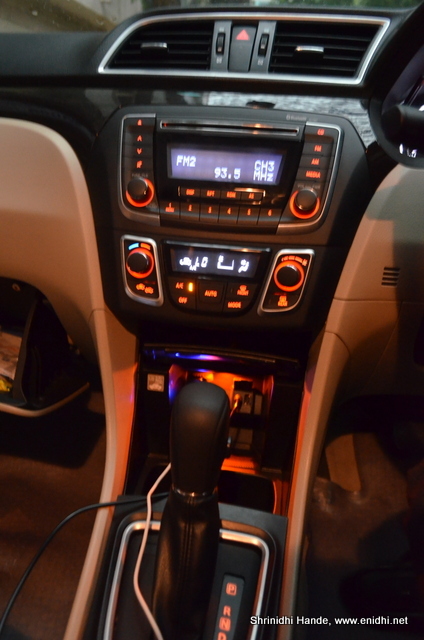 Nice wood inserts give a very high upmarket feel. There is no paddle shift. Maruti seem to have taken a clue from Ford Figo.. Bluetooth and call buttons are positioned on a separate extension, not on the spokes of steering wheel. Doesn't look like Ciaz is made with lots of components lifted from Swift. Most of the components seem to be newly made for Ciaz. VXi + only gets parking sensors- no camera. And there is a button to turn off this sensor- why would anyone want to turn off reverse parking sensor? First row head rests get height adjustment. 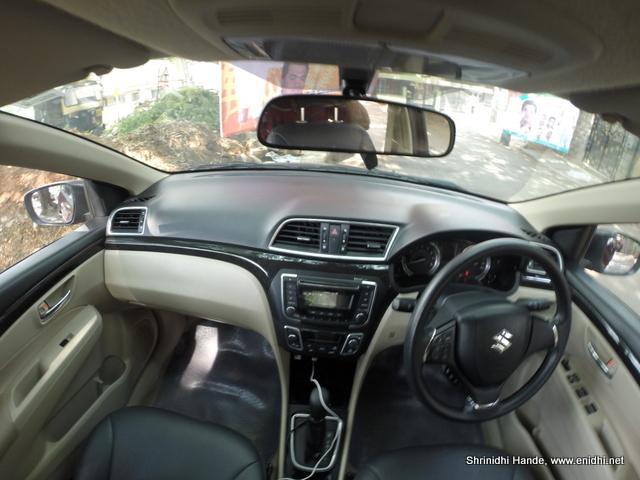 Very spacious legroom is very apparent when you sit in Ciaz. Rear row doesn’t get an adjustable head rest. Second row central arm rest has cup holders but covered up by seat covers. Space is very ample all over the car, including a very large boot. Tail lamp cluster now looks similar with few other competition brands. Celerio VXi + AT competes with City, Sunny and Verna automatics. 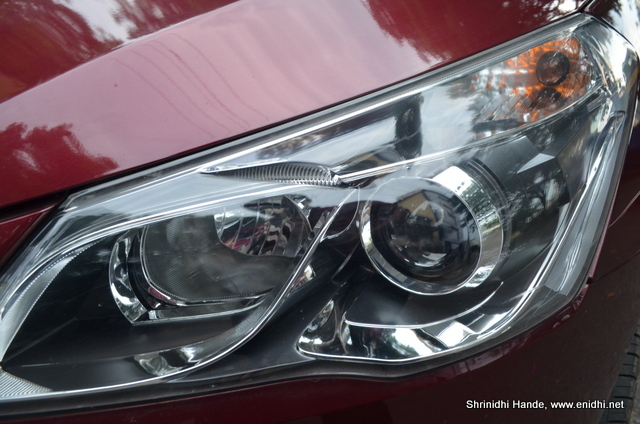 Ciaz has slightly less power than the competition but is bigger in size and is priced cheaper. 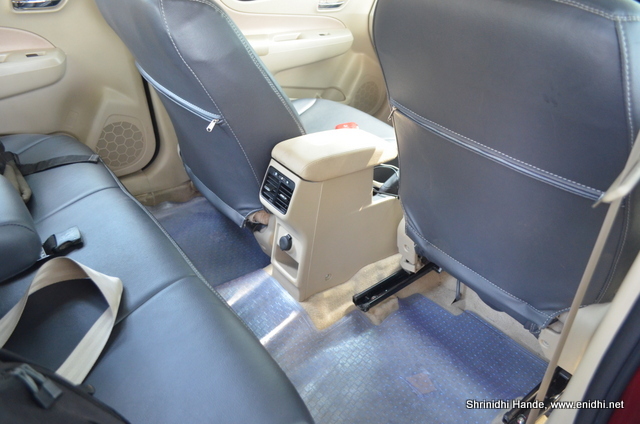 City AT gets leather city (Ciaz= fabric), an extra airbag and few more goodies for the price difference. I have not driven other petrol automatics that compete with Ciaz- such as city and verna, hence unable to benchmark ciaz against them. 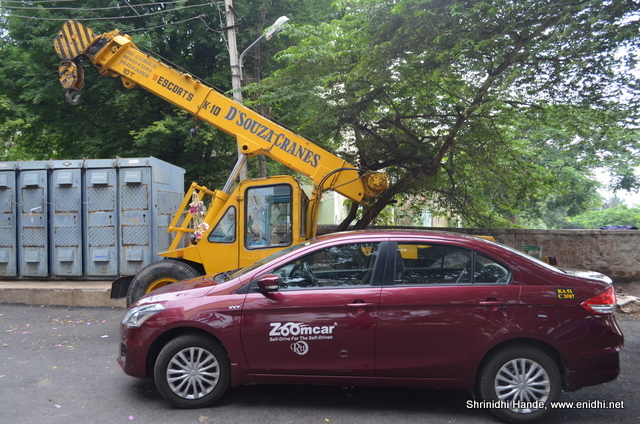 Ciaz is one of the affordable practical automatics to rent in Bengaluru (the cheapest option- E2O doesn't really count, next alternative is A Class or GLA Class or C Class that cost two times in rental amount per day. Overdrive off (3rd), 2 & L is used to get engine braking while going downhill. If you leave it in D, the car keeps accelerating down the slope, just like a cycle going downhill would. Uphill, the right gear is selected automatically anyway, depending on load. With the ever increasing traffic, automatics are the future if you value a peaceful & stress-free drive. Take an automatic on Mysore Road on a weekend in peak traffic, and you'll realize just how much difference it makes. 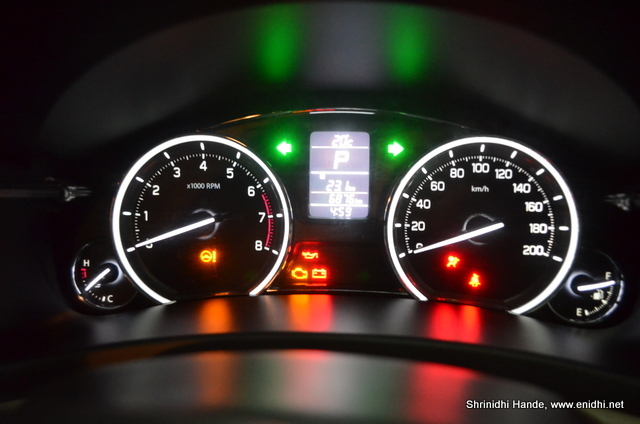 Since the Ciaz is priced on par with the city, one needn't pay extra for the convenience of an automatic transmisison, even though it's a petrol. PS: One should shift to N if stopping the car for more than a few seconds (with engine running), else the transmission fluid might overheat. Shift back to D when you're ready to move. Thanks for your valuable inputs. Care to leave a name behind? Thank you for your review. It was really helpful for me. Don't know why no magzines has ever reviewed the Ciaz Automatic comprehensively. I recently hired the same car here in Pune. Took the 80km package from Zoomcar. Had a quick lunch near Lonavala and retured within 4hrs. The car I hired was good. All the bells and whistles were working. What I din't like about the car is that it tends to lose momentum and struggles to upshift when you are in a ghat road. Turning off the overdrive does help. Putting it in "2" is the best. I had put her in "2" and drove down a steep slope just to see the engine braking and it worked really well. I am planning to take the same car to our Pune-Goa-Pune vacation in October. Apparently no one hires an automatic in Pune and hence the car was in great condition. I love your columns. Keep up the good work.